Our air ring design combines various elements by using entry ports and dual lips to produce excellent bubble stabilization and higher cooling capacities. They are also used with nylon and HMW-LDPE. In blown film applications, the cooling of the melt governs the film quality and the output rate. UPE’s single-lip air rings are extensively used for high density polyethylene and in narrow tubing blown film applications with a stabilizer ring. UPE offers its “Aero-Dyne” series of adjustable, dual-lip air rings for blown film applications for 1” diameter to 120” diameter dies, delivering superior bubble stability and gauge control at high output rates. 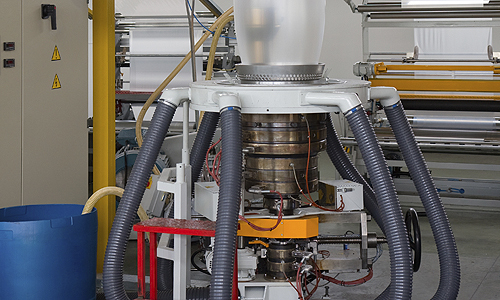 Along with the air ring, we also offer plenum and hoses to variable speed-controlled towers. “Aero’-Dyne” air rings provide superior gauge uniformity with ease of operation – locking of the bubble is effortless, regardless of its size.